If you have not heard of As A Man Thinketh by James Allen, then you're missing out a powerful course that can literally change your thought process to achieve success in life. In fact, even the world's #1 success coach, Anthony Robbins had mentioned As A Man Thinketh in one of his courses. Instead of reading the book, I'm going to give to you a FREE As A Man Thinketh by James Allen MP3 Audio Course CD with no string attached. Until thought is linked with purpose there is no intelligent accomplishment. With the majority the barque of thought is allowed to drift upon the ocean of life. Aimlessness is a vice, and such drifting must not continue for him who would steer clear of catastrophe and destruction. They who have no central purpose in their life fall an easy prey to petty worries, fears, troubles, and self-pitying, all of which lead, just as surely as deliberately planned sins (though by a different route), to failure, unhappiness, and loss, for weakness cannot persist in a power-evolving universe. This is the real famous classic of the As A Man Thinketh by James Allen material. It's the complete course and you're getting this with no-string attached. So if you're wondering why in the world I'm doing this ... there are many reasons to it. First, I think this course will definitely help you become more successful in life and I simply wants to share it with you. Secondly, the more value you're getting from me, the more you'll appreciate the products that I've created and be creating. Thus, it'll be easier to get you to become my future customer (At least I'm being honest!). It's business sense. But for now ... I got nothing to sell to you in the audio course. It's all packed with pure, rich content in this CD. YES Patric! 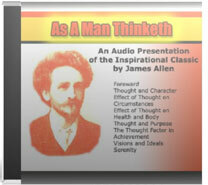 Rush me the FREE CD of 51-Minute As A Man Thinketh MP3 Audio Course by James Allen. I understand that I can get this CD absolutely FREE while the offer is still available!